Alain Ducasse offers a “naturality” menu at Hôtel Plaza Athénée. 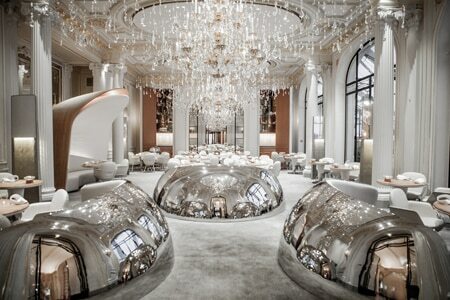 : At the beginning of this century, Alain Ducasse caused a sensation under the gilded ceilings of the Plaza Athénée. Although he was carefully and smartly sticking to the classics, Ducasse blew a breeze of youth into this venerable bastion of the international establishment with the way he turned the market's best ingredients into rare dishes that still reflected the great French tradition. Thanks to several months of closure for renovation, Ducasse has taken advantage of this lapse to rethink the menu. Décor has undergone a few modifications as well, complemented with new chairs, circular banquettes, a table topped by what looks like a boat’s hull and, in the back of the dining room, a cabinet of curiosities filled with old books and artifacts. The menu is now centered on “naturality” according to the term coined by Ducasse, highlighting sustainable fishing, vegetables from Le Jardin de la Reine inside the Palace of Versailles, and cereals. Replacing Christophe Saintagne, Romain Meder, a loyal lieutenant of Ducasse who notably worked at IDAM in Qatar, delivers impeccable and clear flavors, making sure to not overload the preparations with too many tastes in order to neatly showcase the main products. Excellence pervades sophisticated yet uncluttered dishes like the green lentils with caviar in jellyfish, the ceps tart with lukewarm blue lobster, Atlantic sea bass with leeks and black olives and, to finish off the meal, a pastry made with coffee and chocolate from the Ducasse factory and roasted buckwheat. The endless wine list, overseen by head sommelier Laurent Roucayrol, includes options such as a red, fruity and reasonably priced Saint Joseph and a more elaborate Côte-Rôtie, la Fleur de Montlys, as well as an impressive selection of Grandes Marques Champagnes. Service is meticulously performed by smartly dressed waiters under the watchful attention of the maître d', Denis Courtiade.